one morning i looked at the mug i was drinking coffee from. it is a mug from the french alps, but you wouldn't say so from the look of it. i asked myself what it would look like, morning, noon and night? playing around with light and atmosphere, i soon brewed me another cup. this weekend, helen finds whimsical solace in mornings, noons and nights. i like the idea about the different atmospheres in the course of the day. you must have a nice window to sip your coffee next to. wonderful cups, and this tiny bird there! but my coffee will take place in a cup and for today I will chose the polka dotty one! ooooh lovely spotty mug Nadine!!! and different brews too I think Im going for night to drink looks strong and caffiene infused. Now, I'ld like to have a red polka-dotted mug!!! I like this!!. I wonder why a bird in the middle cup (sun) and I wonder what other animals you would draw in the other two cups???? 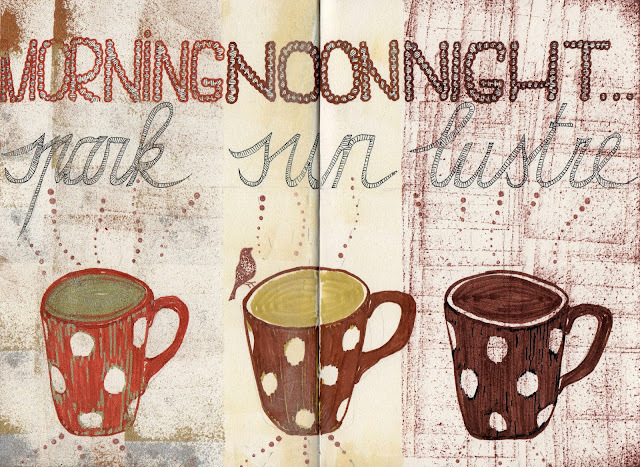 Ohhhh this is a clever idea to draw your mug according to the time of day. I notice that each drawing shows the mug full and steaming! Ah, coffee makes it worth the journey through morning, noon and night, eh?! An entertaining concept, to be sure!! And tasty. spark sun lustre... oh, what a promise, dear Nadeschda! Love the different light situations and atmospheres. Look at the colour of the coffee, wow! And the morning cup... too full and hot in the morning? You are on a roll with this fabulous art Miss Momma....talented! I'm hosting next if you'd like...solstice - hope you have a great week !